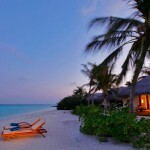 The enchanting resort of Velassaru Maldives lies 25 minute by speedboat from Malé. 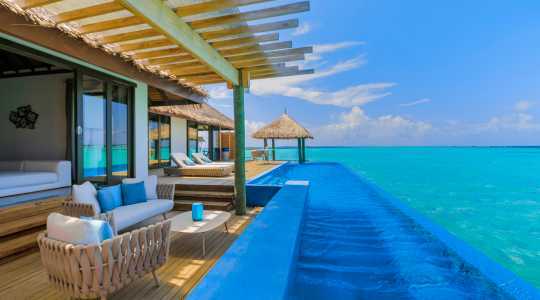 Here you will enjoy a private hideaway accented by chic luxury and breathtaking tropical surroundings… Fully immerse yourself in the beauty and bliss offered by this exclusive resort, a member of ‘Small Luxury Hotels of the World’. 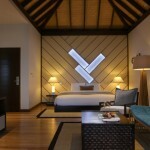 Each day at Velassaru Maldives is a chance to create unforgettable memories. 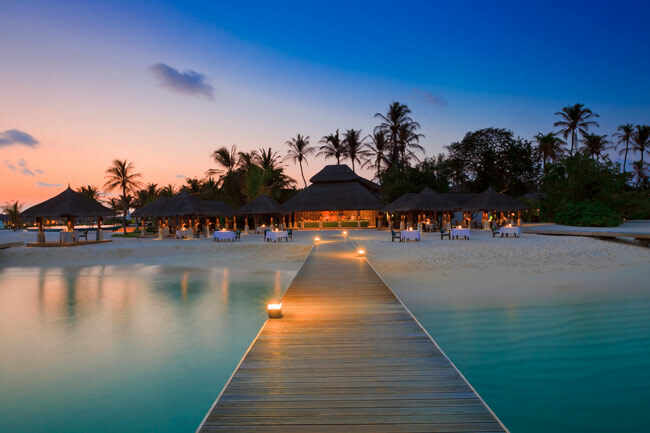 Endless days at the striking white beach, unique dining experiences by the beautiful lagoon and outstanding service make your Maldives holiday one to hold in your heart forever. 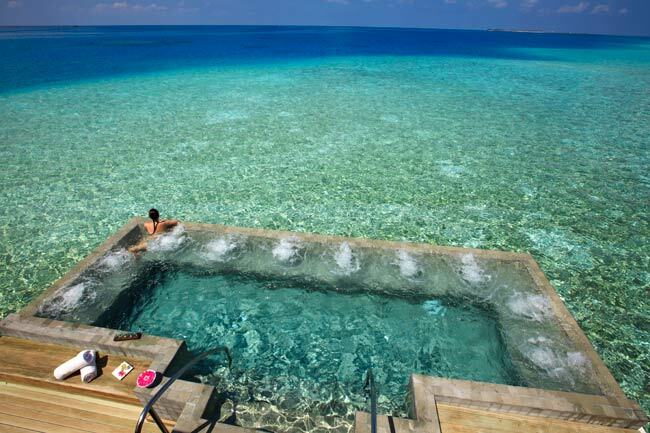 This resort never fails to impress. 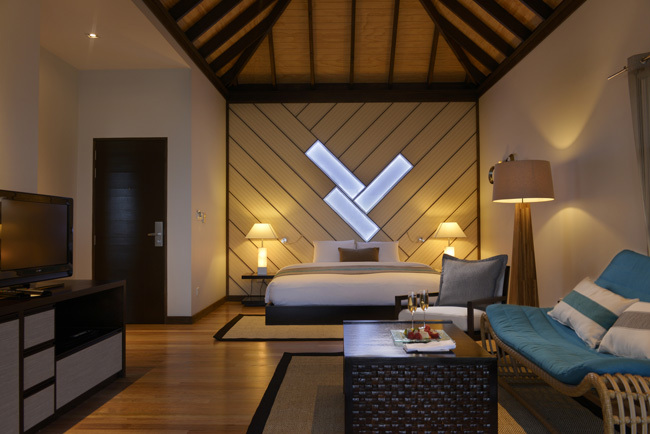 You haven’t experienced luxury before you visit Velassaru Maldives – the epitome of holiday indulgence. 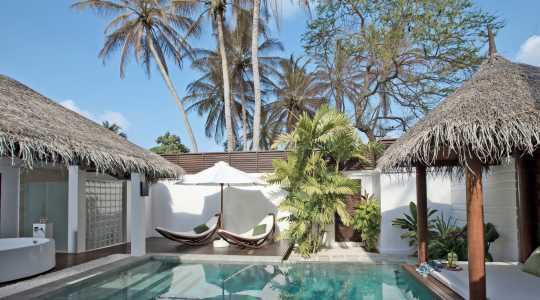 The Deluxe Bungalow (70 sqm) is located only steps away from the glorious Indian Ocean. 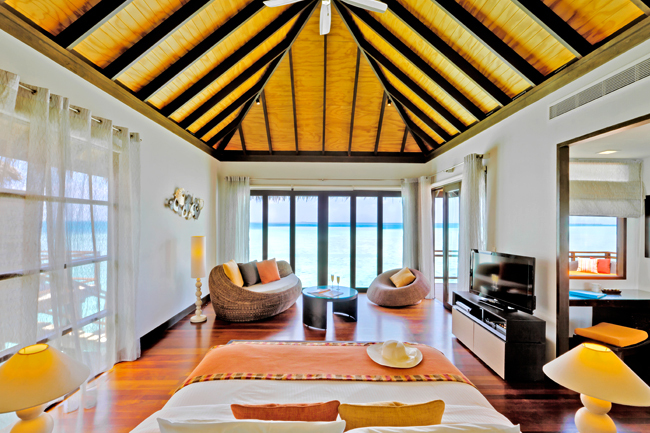 The bungalow is split into two levels, with the amazing bed area on the top floor overlooking the sitting area. 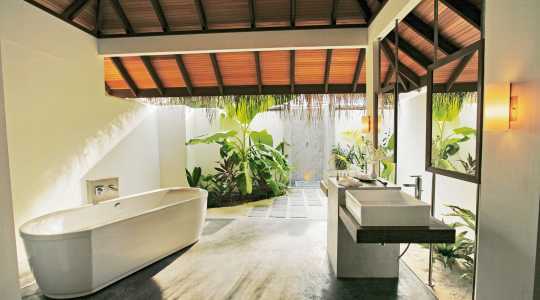 The Deluxe Bungalow also features a private terrace and an outdoor bathroom with a lovely rain shower. 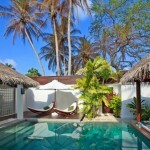 These newly refurbished larger villas (75 sqm) are set in the lush tropical gardens on the island. They feature a split-level bedroom and living room and are only a few metres from the water. 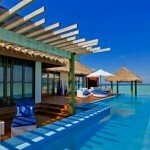 The Beach Villas (96 sqm) are located on the east side of the island and offers seclusion and privacy. 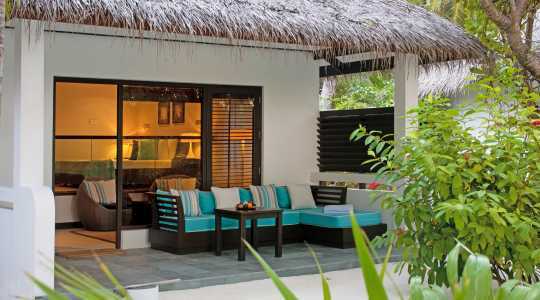 Located right by a stunning beach, the private verandah makes the perfect spot for lazy days of sunbathing. 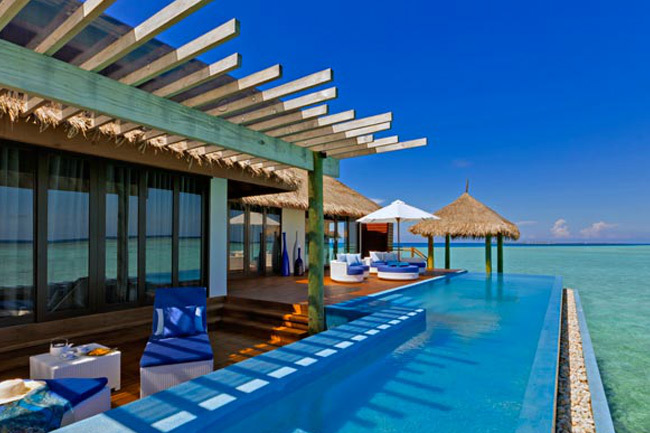 These thatched Beach Villas all have direct ocean views and their own private courtyards. 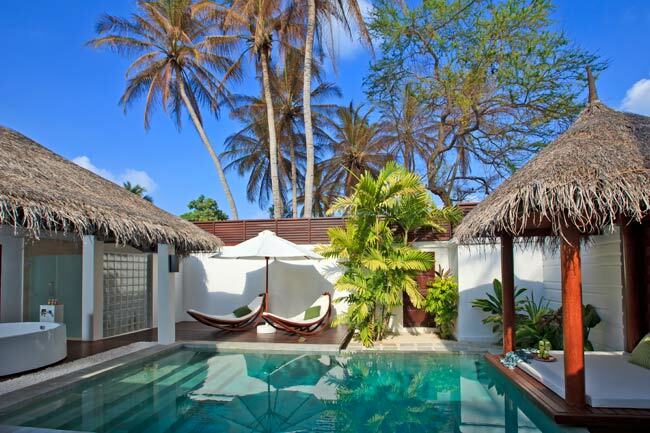 The Beach Villa with Pool (96 sqm) is an exclusive villa featuring a private plunge pool. 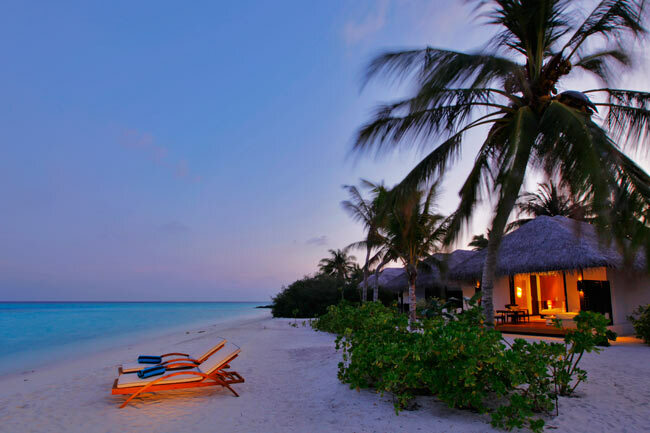 Located right by the stunning beach, this is the ideal place to watch the sun set across the Indian Ocean. The lavish outdoor bathroom is complete with a bathtub and a rain shower, and you can keep your wine cool in the in-room wine chiller. 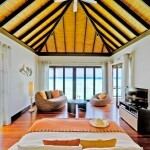 The Water Bungalow (80 sqm) is located just off the east side of the island. 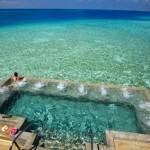 It features an amazing private pool, as well as a large outdoor deck for your relaxation. 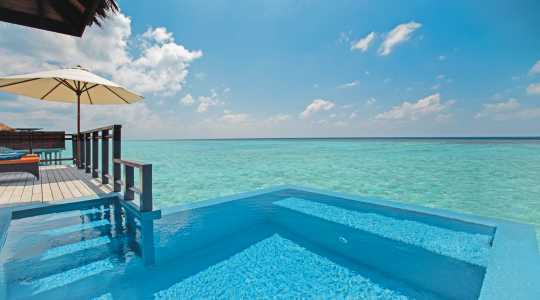 Standing directly over the marvelous Indian Ocean, this is one of the more romantic accommodations of Velassaru. Floor to ceiling windows make for outstanding views, while the earthy tones of the interior add a relaxed feeling to the Water Bungalow. 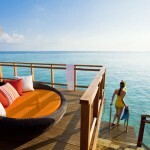 The Water Villas (112 sqm) are stylish in every way, situated above the Indian Ocean with excellent sunset views. 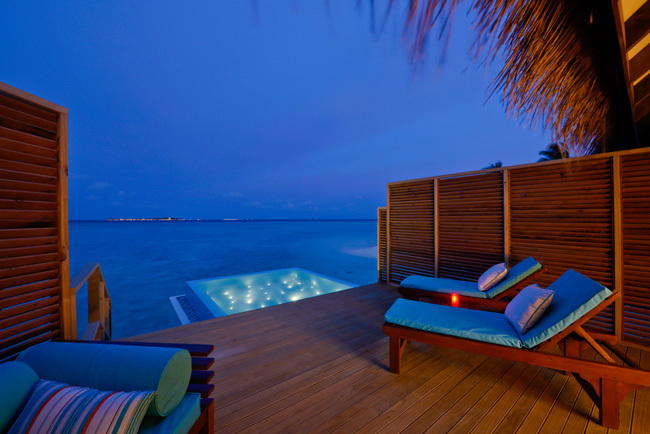 Your private sundeck leads directly down to the lagoon, meaning a refreshing swim in blue waters is never far away. 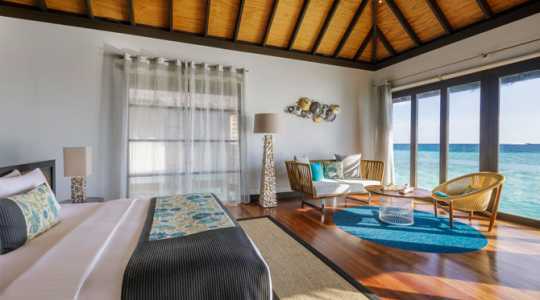 The Water Villa features a king size bed and a luxurious bathroom with a lovely bathtub. 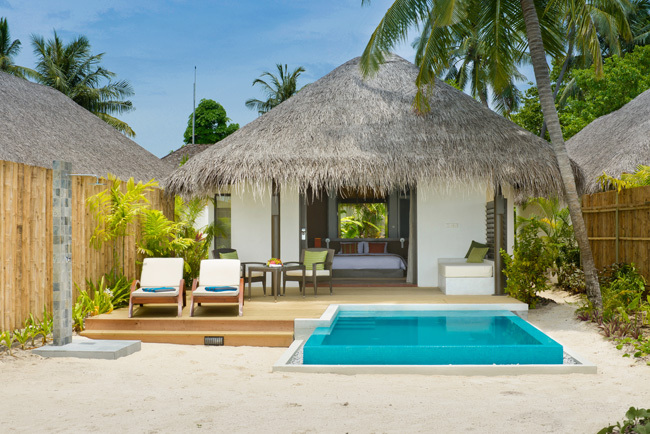 The Water Villa with Pool (112 sqm) features the same comforts as the Water Villa, but with the added luxury of a private plunge pool on the sundeck. 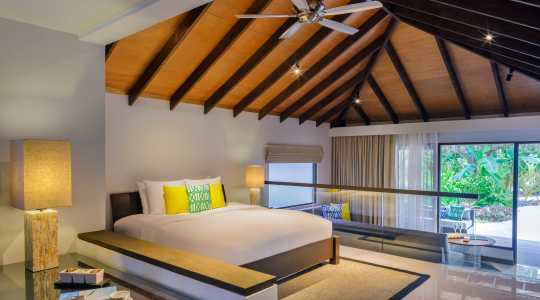 Newly refurbished rooms the Deluxe Villa with Pool (110 sqm) has a split-level bedroom, lounge and spacious open-air bathroom which opens up to a private garden courtyard with an oversized plunge pool, sundeck and outdoor shower for you to indulge in and enjoy. 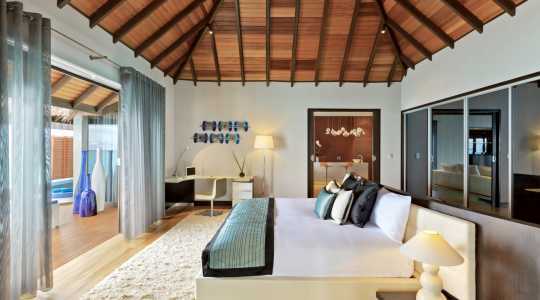 The Pool Villa (175 sqm) is sophistication and tropical bliss in all in one. This villa comes with a private butler, a gorgeous split-level bedroom and a large pool. Your pool deck makes for lovely days of sunbathing, sipping on exotic cocktails in the sunset and taking refreshing dips in the pool. There is also an amazing garden shower. 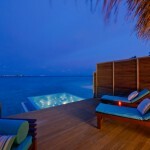 The Pool Villa is everything you need for a serene Maldives holiday. 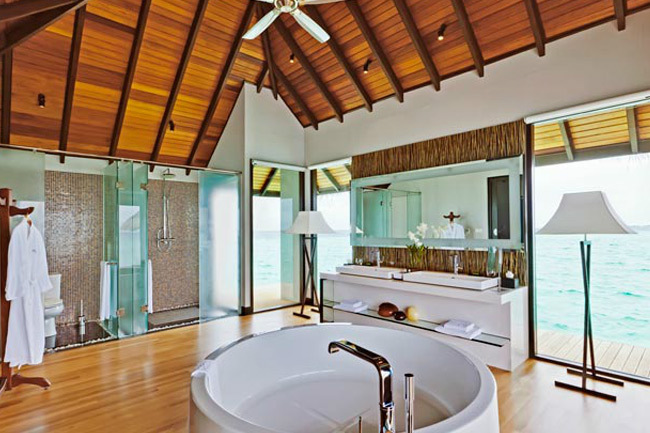 The Water Suite (270 sqm) is both chic and impressive. 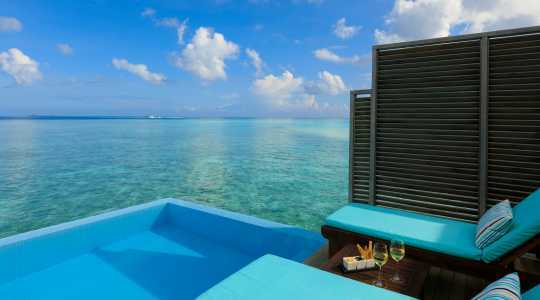 Spectacular panorama views of your surroundings, a private butler and private access from your terrace into the turquoise lagoon make the Water Suite ideal for a holiday of complete indulgence. Your private terrace includes a stunning infinity pool, dining area and a rain shower, which means you will spend as much time outside as inside. The modern interior with a bar area, home theatre system and designer linens and bath amenities add further luxury to your holiday. 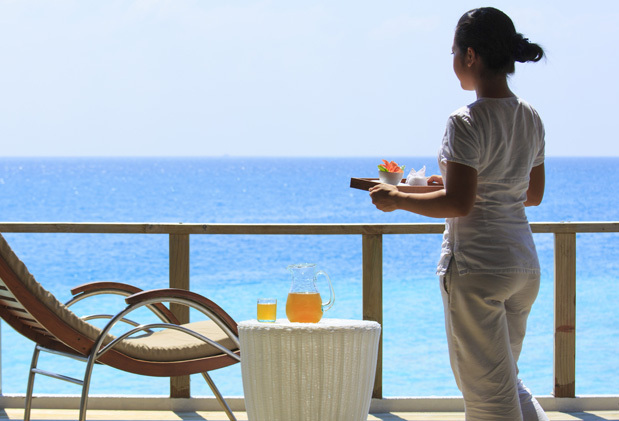 With its attentive around the clock service, modern facilities and wide range of activities, Velassaru Maldives leaves you asking for nothing more. Facilities and services include currency exchange, laundry service, a boutique, onsite doctor and an amazing infinity pool for the use of all guests. 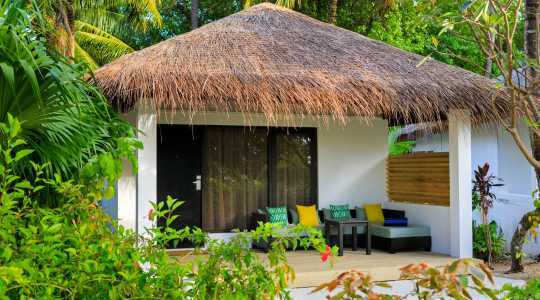 The excellent tennis courts and the fully-equipped gym provide you the opportunity to get active on your Maldives holiday, while the water sports centre has waterskiing, paragliding and catamaran sailing just to mention a few thrilling water sports available. 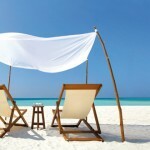 If you want to discover more of the Indian Ocean, both snorkeling and scuba diving make for unforgettable experiences. IMMERSION Dive Centre offers great value diving courses. 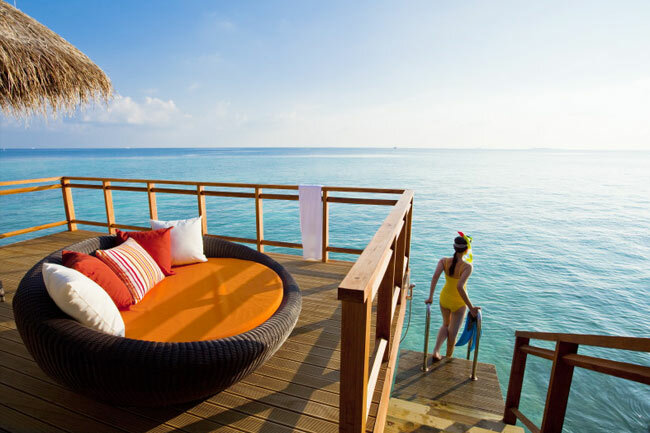 In addition, Velassaru Maldives offers popular excursions including boat trips to Malé, sunset cruises and night snorkeling. The onsite spa features a steam room, over water treatment rooms and an incredible hydrotherapy pool, ensuring your complete relaxation. Here you can wind down completely in serene surroundings and indulge in wellbeing. How about a Tropical Ecstasy shower treatment or an anti-aging facial? One thing is certain – you will never feel as relaxed as you do when you the skilled spa therapists have worked their magic. 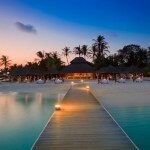 Dining at Velassaru Maldives means creating memories for a lifetime. Treat yourself to new flavours and excellent service in one of the five restaurants, or go for the ‘Private Dining’ experience. Sand makes for a truly authentic Maldives dining experience. This venue is located on the gorgeous beach and features a hot stone grill. Vela Restaurant is the relaxed main restaurant which offers brilliant dishes from all over the world. Here you can indulge in gourmet breakfasts, freshly caught sea food and watch the chef prepare your food in the live cooking stations. 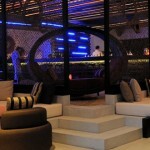 Turquoise Restaurant is an intimate a la carte restaurant with Asian and continental flavours on the menu. 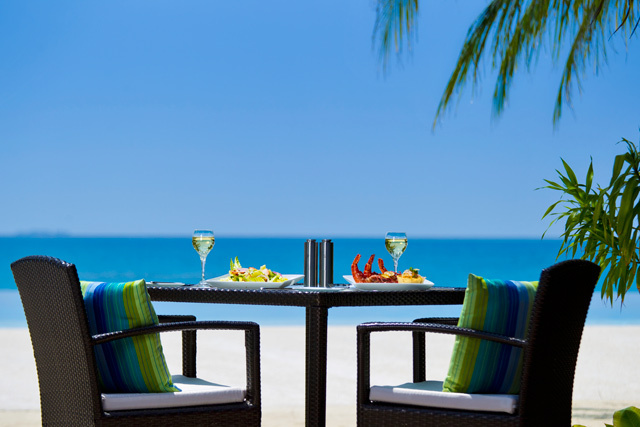 Enjoy your fantastic meal in the shade of swaying palm trees. Etesian is your choice for a dinner with a difference. Enjoy New World wines together with exceptional Mediterranean cuisine. Fen Bar is located next to the lobby. This is a chic bar to visit with your loved one for a glass of red wine. Snacks are also available. Chill Bar on the east side of the island is your chance to enjoy an exotic cocktail overlooking the stunning Indian Ocean. Do try the tapas too! 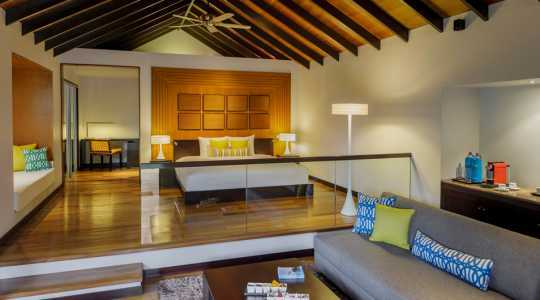 Simply Maldives Holidays offer a Bed and Breakfast option, Half Board Package, a Full Board Package and an Indulgence Package to guests staying at Velassaru Maldives. One complimentary bottle of Taittinger Champagne, Tapas at Chill Bar (a selection of 3 Tapas dishes together with two glasses of sparkling wine), L’Occitane Gift Pack and a 25.00 USD spa credit.